Our mission is to elevate and strengthen leaders and organizations who are solving important community issues. In addition to our core programs, we offer tailored workshops, free community workshops, and coaching to help leaders and organizations increase their impact. We also work with boards and executive leadership teams to plan meaningful retreats and strategy sessions. We offer a variety of customizable workshops and tailored strategy sessions to help kick your organization and your leadership into high gear. Develop a big bold vision based on a strong needs statement and clearly achievable goals and make sure you have the strategy to get there. Build a powerful team with robust tools for hiring, onboarding, and team culture setting. Shift from a fixed mindset to a growth mindset to help your team meet clear performance expectations. Rethink the way you approach investors/donors and ask for money with practical tips and tools to help you plan and execute a successful fundraising campaign. This session will build skill in fundraising strategy, donor cultivation, and in making “the ask” with increased success. Planning for a complex project? Learn how to Identify your project goals and backwards plan using practical tools to ensure that your vision becomes a reality. The impact you seek to have is only as good as the plan behind it. Nonprofit boards have the potential to be catalytic for organizations and for the members themselves, but so often, they fall short of reaching their potential. This workshop will tap into the science behind cultivating a strong board, with a focus on how to recruit, retain, develop, and empower board members, and how to leverage boards to increase fundraising. This session is beneficial both for staff members and for board members. Hone your content and style to inspire action and interest. Learn how to confidently and successfully compel others into interest and action for your venture. Understand how you are perceived vs. how you want to be perceived. Align your materials to your brand and learn how to better cater to your target audience. Take back control of your greatest asset: your time. Craft a dream calendar that aligns powerfully to the things that matter most for you. Unearth the factors that sabotage your calendar, and learn how to maximize every meeting, and every hour to pursue your goals. If you’ve ever asked yourself “what impact are we making on the constituents and communities we serve?” then this workshop is for you! We’ll identify key outputs and outcomes you’d like to track as well as explore strategies for collecting the data you’ll need to assess your impact. Align your organization around a strategic roadmap for where your organization will head over the next 1, 5, or 10 years. This session will help you articulate your core priorities, map out your next steps, and align your resources and time to the things that matter most. Want to go deeper into one topic or skill in particular? You can schedule private, one-on-one, executive coaching sessions with someone from our team. We will work with you at your pace to help you achieve your goals as a leader. In 2018, we are also offering our knowledge, expertise, and resources to organizations at large to help accelerate their social impact. We've got an exciting year ahead filled with free community workshops and office hours. Sign up below! Gain the knowledge and tools you need to take your social impact organization to the next level with our free workshops. We're always working hard to bring some great resources your way. Visit our Facebook Page for more information on our upcoming programming! Stay tuned for Community Workshops taking place in 2019! 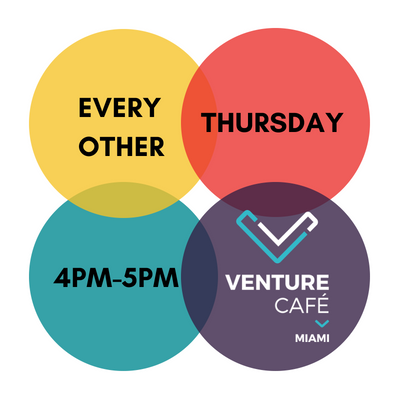 Sign up for our free office hours at Venture Café Miami to meet with someone from the Radical Partners team one-on-one.